I would say that whether you have children or not, once you start reading this book, you won’t be able to put it down. And later, after reading it, you’ll want to share it with others. ‘The Spark’ by Kristine Barnett is one of the books that shook my world, and I couldn’t close it until I reached the last page. Because I had to find out Jake’s story. With an IQ higher than Einstein’s, Jake is thought to be an eligible candidate for the Nobel Prize in astrophysics, at only 17. 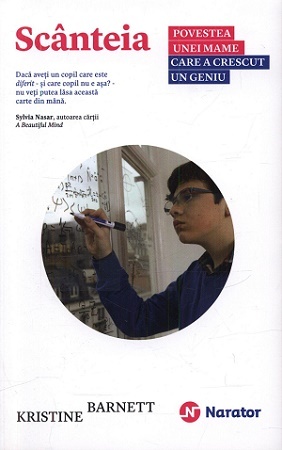 This story is even more spectacular because his extraordinary mind is almost lost to autism. Have I got your attention? 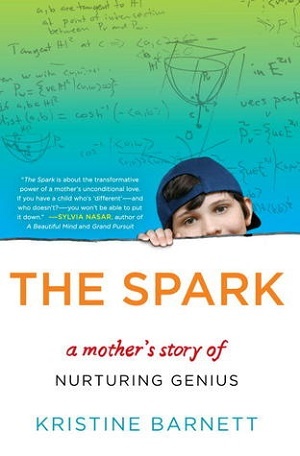 ‘The Spark’ is one remarkable memoir of a mother about her son, the story that she lived and wrote to restore hope to those about to lose it, and even to those who’ve already lost it. Kristine begins her story with an amazing scene. During a university physics course, while sitting at the back of the classroom, her attention was caught by her own nine year old son who was explaining a complicated equation to some of his colleagues. This was her little boy who had been diagnosed with autism. Doctors had even said that he would not talk or read again. Although Jake made his first steps in life hungry for information, he retired at one point in his world. He retired through cards with colorful letters, among shadows and wool yarns. I don’t know if it happened to you, but while I was reading this book, I felt smaller and my daily problems were suddenly unimportant. I stepped into Kristine’s world and her reality hit me. It was a cruel reality, with happy moments but also sad moments – the kind that nobody should live. Although her son’s destiny seemed to be already written in gray letters, she never gave up. The doctors gave a diagnosis that would’ve made others resign. But she preferred to risk it. She pulled her child off from special education, and started preparing him for mainstream kindergarten. There was one moment, that special moment when she took Jake outside the city in order to show him the sky with all the stars. Then and there was the beginning of a wonderful story. Jake would never be free of autism, but instead he would have a brilliant mind due to his parents’ faith. They went further despite the difficulties, the financial and health issues. Kristine’s story is an example of determination and optimism. I can only imagine the despair experienced by her and her husband for the sake of their children (Jake and his two younger brothers). The way they managed the situation is an example for us all. I recommend this book! As I said before, it’s a book that must be read whether you have children or not. It’s about the power of love and courage, about finding the spark in the shadow and make it shine like no other. P.S. Before you read the book, you must watch the video below. He is Jake – Jacob Barnett.